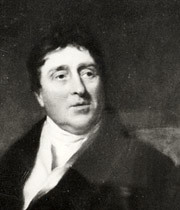 Thomas Telford worked on over 33 canal projects in his lifetime and was a huge advocate of their benefits over those of railways. In the UK, 1792-94 were the years of 'canal mania', when over 39 new canals were authorised. At this time, railways were mainly used in industries such as mining. Iron rails came along in 1789 but most railway wagons were still horse drawn. The canal and waterway network was the backbone of goods transport in the country. Telford's first main project was the 110km Ellesmere Canal, which joins the rivers Mersey, Dee and Severn. Planning was already underway when he took the impressively-titled post in 1793 of General Agent, Surveyor, Engineer, Architect and Overlooker. This role was to mark his transition from architect to renowned engineer, and saw a breakthrough in structural engineering practice. William Jessop was the principle engineer of the Ellesmere Canal. He proved to be a great influence on Telford's work, and they were soon to work together again on the Caledonian Canal in Scotland. Undoubtedly, the Pontcysyllte Aqueduct, which carries the Llangollen branch of the Ellesmere Canal over the River Dee, is the most impressive of the structures associated with this project that were built under Telford's direction. It has been acclaimed as the greatest structural achievement of the canal age and is now a designated World Heritage Site. You can read a great deal more about the aqueduct on its own page: Pontcysyllte Aqueduct. Most canals before this date follow the contours of the land, taking roundabout routes in the face of obstacles such as river valleys. Telford daringly took to the air and designed a navigable aqueduct 307m long, resulting in the glorious sight of canal traffic going about its business some 40m above the River Dee. With Jessop's support and approval, cast iron plates were used to form the trough holding the canal water. Soaring masonry piers and abutments support the trough. This proved to be a revolutionary development and one that Telford considered to be one of his greatest achievements. 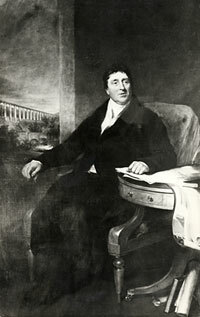 The aqueduct features on his personal seal and appears in the background of his portrait by Samuel Lane. His embryonic sketch is dated March 1794 but the design wasn't developed fully until the iron trough concept was proven as practical with the Longdon-on-Tern Aqueduct (1795-96) on the Shrewsbury Canal  the first cast iron aqueduct in the world. 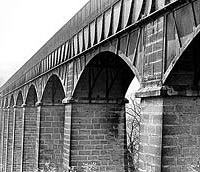 There have been attempts to downplay Telford's role in the design of Pontcysyllte Aqueduct but evidence shows that it was designed and executed under his direction. One of Telford's great talents was his ability to assemble capable and reliable people around him, which enabled him to do so much work without losing control. The team he pulled together for the construction of the aqueduct, including ironmaster William Hazeldine, went on to work with him on his next great challenge  the Caledonian Canal. The Caledonian Canal (constructed 1804-22) is the most ambitious of the canals worked on by Telford. At 96.5km long, 30.5m wide and with 28 gargantuan locks, it was a huge undertaking and was to be the most advanced ship canal in the world at the time. Jessop worked on it with him up until 1812. There were many innovations developed for the project and it brought together the use of iron railways, steam engines and dredgers, and groundbreaking lock design. Engineering knowledge was advanced hugely. The project provided much-needed instant employment for the local Scottish communities  more than 1,385 men were employed in 1811  and a newly-skilled generation for the future development of Scotland. However, in some ways the project was less successful. It saw a massive cost increase  twice the original estimate  took 18 years instead of seven to complete and was built to a depth of 3.65m instead of the planned 6m. One of the main reasons for building the canal was for naval use during the Napoleonic wars but by the time it opened in 1822, they were over. However, Telfords reputation was travelling far. While journeying around Britain overseeing his work, he was offered the role of consulting engineer to a 184km extension to the Trollhatte Canal in Sweden. The Gotha Canal (1809-33), as it is known, now links the North and Baltic Seas via a string of natural lakes. His work on the Caledonian Canal made him the ideal man to lead the project. He took on the role from afar and visited only twice  in 1808 to produce plans and estimates, and in 1813 to remedy some of the numerous problems on site. Count von Platen directed the work, and operations were overseen first by a Norwegian, Bagge (drowned 1814), followed by Lagerheim. Work may well have come to a halt through financial and political hold-ups if it wasn't for von Platen's enthusiasm and energy. Throughout the reams of correspondence between him and Telford, it's clearly evident that the two formed a firm friendship and that von Platen greatly respected Telford. In 1809, Telford was made a Knight of the Swedish Royal Order of Vasa, for his services. Von Platen died in 1829 and didn't get to see the completion of the canal, which was delayed until 1832. Back at home, Telford continued to work on a vast catalogue of canals for the rest of his working life. Inded, he can be thought of as the last of the great canal engineers on the Industrial Revolution. Among the achievements of his later years, Harecastle Tunnel stands out as remarkable feat  only three years to tunnel 2.7km using only 15 shafts. Work on improving the Birmingham & Liverpool Junction Canal showed a similarly bold nature. His direct-line approach saved 19km on its length and dramatically straightened, widened and lowered the waterway. The improvements were so good that local boatman developed good manners and squabbles over rights-of-way disappeared!